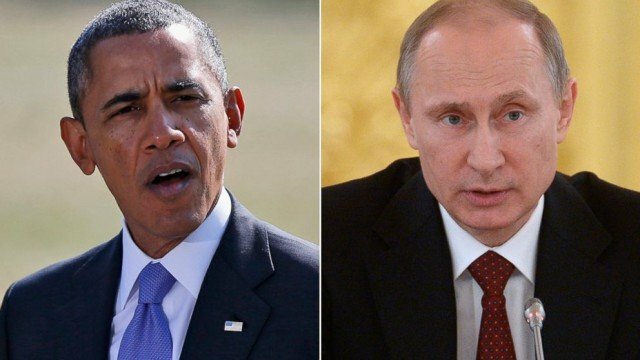 President Barack Obama has called President Vladimir Putin urging him to use his influence to make separatists in eastern Ukraine stand down. The phone call between Barack Obama and Vladimir Putin came as pro-Russian activists continued to occupy buildings in eastern towns. For his part, Vladimir Putin rejected accusations of Russian interference, calling the reports “unreliable”. Meanwhile, Ukraine’s acting President, Oleksandr Turchynov, has announced the start of an “anti-terrorist operation”. The extent of the operation was unclear but unconfirmed reports on Russian media, quoting separatists, speak of Ukrainian armor being on the move near the flashpoint towns of Sloviansk and Kramatorsk. Tanks and armored personnel carriers could be seen parked 44 miles from Sloviansk on Monday. “The president expressed grave concern about Russian government support for the actions of armed, pro-Russian separatists who threaten to undermine and destabilize the government of Ukraine,” a White House statement said. The statement said Vladimir Putin had urged Barack Obama to “use the resources at the disposal of the American side” to help prevent any bloodshed.